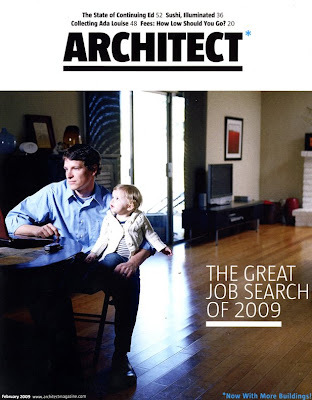 Real Life LEED is excited to announce that it has been featured in this month's Screen Grab feature of Architect. It should go without saying that Real Life LEED is very honored and thankful to receive this coverage, but I just said it anyway! The Cover is Sad... yet I'm happy! For those of you that are regular readers, shoot over to the article to learn a few things about the history of this site, why it was started, and view the most flattering photo of me ever taken (way to go Harold!). For those of you reaching the site for the first time because of the article, take a stroll through the site and let me know what you think by leaving a comment. Way to go, Joel! You look great. The article that mentioned your blog (and a picture of you sitting on a very familiar desk) was in a powerpoint presentation in my ProPrac class today! You are still in Charleston, aren't you? @Sally - Isn't that the only thing that matters! @Lauren - Still in Charleston... that's the one thing the author screwed up, so I can't complain. How's UNCC treating you? Just curious. What was the outcome of the conversation with the CEO about the slowness of the site? I am in the throws of entering everything now, and its like pulling shards of glass out of my skin!